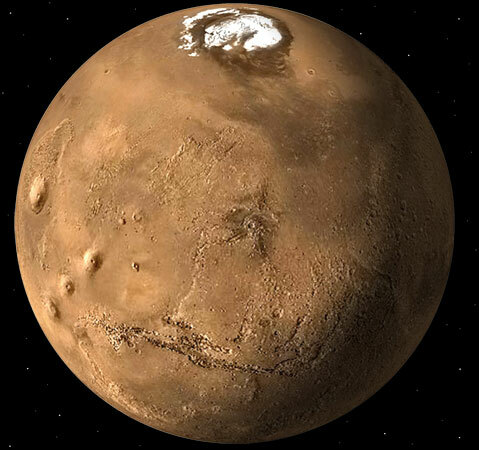 The Mars-Ice project is a joint project between the USGS Astrogeology Research Program (Flagstaff, AZ) and the Arizona State University Mars Space Flight Facilty (Tempe, AZ) to bring together a single resource for the exploration of martian ices. Much of this research is done at the USGS Flagstaff Science Center. On Earth, there’s a plethora of variables driving environmental change, from natural processes to the activities of humans. While Mars is most similar to Earth of all the known extraterrestrial worlds, its climate is still extremely different from our watery abode. The recent discovery of ice on the red planet’s surface has given us a new climate driver to study. Understanding the behavior and history of ice on Mars will give us an ever increasing understanding of our neighbor’s climate. 2003-06 Morphology and Composition of the Surface of Mars: Mars Odyssey THEMIS Results (on the web) Science V300 15628: P. R. Christensen, J. L. Bandfield, J. F. Bell, N. Gorelick, V. E. Hamilton, A. B. Ivanov, B. M. Jakosky, H. H. Kieffer, M. D. Lane, et. al. 2003-03: Early Results from the Odyssey THEMIS Investigation (on the web) Lunar and Planetary Science Conference 34: P. R. Christensen, J. L. Bandfield, J. F. Bell, V. E. Hamilton, A. B. Ivanov, B. M. Jakosky, H. H. Kieffer, M. D. Lane, M. C. Malin, et. al. 2001-10: Mars Global Surveyor Thermal Emission Spectrometer Experiment: Investigation Description and Surface Science Results (on the web) Journal of Geophysical Research V106 IE10: P. R. Christensen, J. L. Bandfield, V. E. Hamilton, S. W. Ruff, H. H. Kieffer, T. N. Titus, M. C. Malin, R. V. Morris, M. D. Lane, et. al. 1998-11: The Martian Surface As Investigated by the Mars Global Surveyor Thermal Emission Spectrometer Experiment (on the web) EOS Transactions AGU V79: P. R. Christensen, et. al.